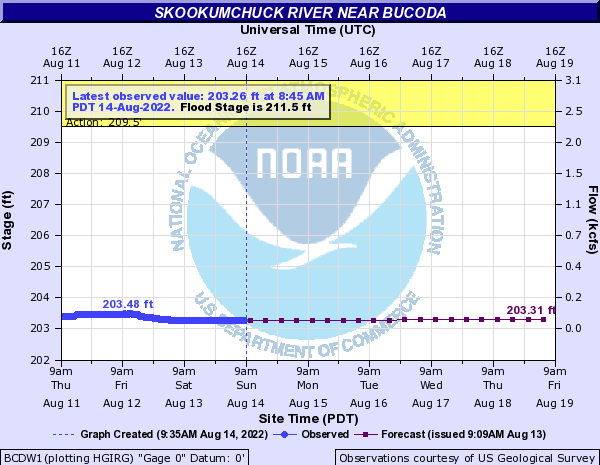 The National Weather Service issues a flood warning for the Skookumchuck River when their forecast model indicates the river will reach a stage of 211.65 feet at the gage near Bucoda. Minor flooding (low-lying roads and pasturelands) occurs at a gage height of about 211.65 feet at the gage near Bucoda. Moderate flooding (individual residences are threatened) occurs at about 213.65 feet, and major flooding (widespread threat to communities and major thoroughfares) at 215.15 feet. 02/08/1996 216.02 11,000 MAJOR FLOOD STAGE The Skookumchuck River in Thurston County will cause major flooding in the Bucoda area...with deep and swift flood waters inundating residential and business areas and numerous roads. Flooding will occur all along the river including headwaters, tributaries and other streams within and near the Skookumchuck River Basin. 211.65 FLOOD STAGE The Skookumchuck River in Thurston County will flood a few roads and low pasture lands near Bucoda. 191.16 10,400 MAJOR FLOOD STAGE The Skookumchuck River will cause major flooding in Centralia and the surrounding area. The river will flood many roads and residential areas and cover much of the farmland in the Skookumchuck River valley. Flooding will occur all along the river including headwaters, tributaries and other streams within and near the Skookumchuck River Basin. A stage of 86.9 feet corresponds to a Phase III flood in the Lewis County flood warning system. 188.76 7,400 FLOOD STAGE The Skookumchuck River in Lewis County will flood several roads and farm lands near Centralia. A stage of 85.2 feet corresponds to a Phase II flood in the Lewis County flood system. 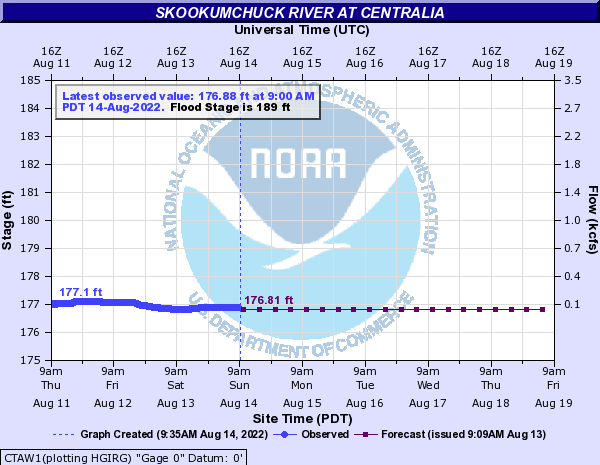 189.96 The Skookumchuck River in Lewis county will spill into low areas along the river near Centralia. This river level on the Skookumchuck corresponds to a Phase I flood in the Lewis County flood system. Note: Flood prediction is not an exact science. Although gage readings and historical data are excellent forecasting tools, please remember that rivers continually change. There are also local factors that can contribute to flooding such as stream and creek discharge into a river, snowmelt and damming caused by fallen trees and other debris. Therefore, during flood situations floodplain residents should not rely solely on gage readings and historical flood levels, but should keep an eye on the river and stay tuned to local media reports. During flood situations, Thurston County Emergency Management posts additional information and media releases on its emergency information page.